For thousands of years, alchemists have dreamed of creating gold out of thin air. Arguably, today’s alchemists are gold analysts obsessed with calling “market tops and bottoms”. The relentless search for this holy market grail doesn’t build retained gold market wealth. That’s because gold is simply an asset that is either on sale or not sale. It is on sale now. Shoppers in a grocery store have no interest in market tops or bottoms for tomatoes. All they want to know is if tomatoes are on sale or not. Investors need to approach gold the same way. From the $1380 high to the recent $1240 area low, gold has given investors a $140/ounce price sale. 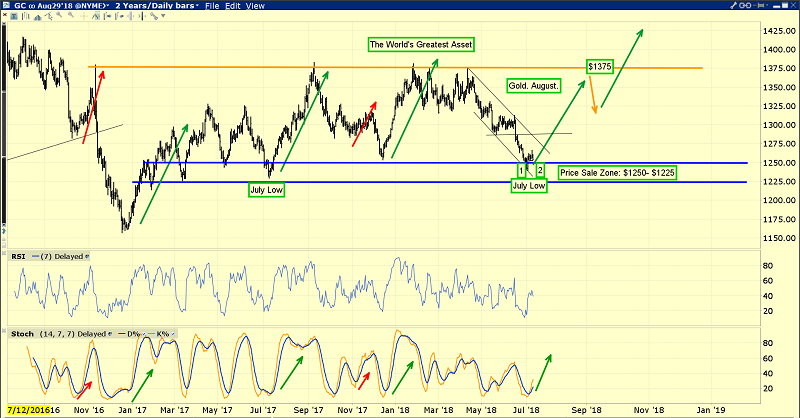 Technical indicators are oversold, and when that happens in July or December, gold can stage enormous rallies that build sustained wealth for enthusiastic gold market shoppers. Unfortunately, the Chinese yuan and the Indian rupee have tumbled against the dollar. Most of the world’s gold demand comes from China and India, and the price sale that investors see there isn’t as big as it is in dollars. 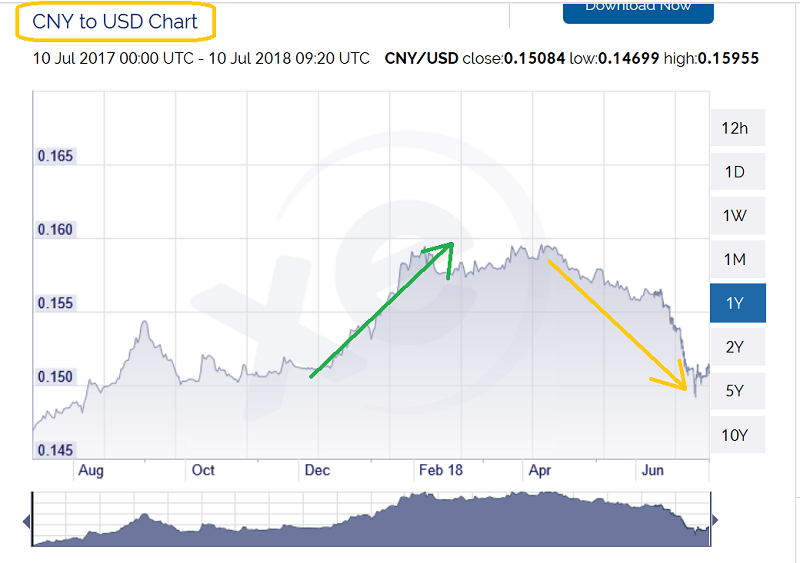 While it appears to be basing now, the yuan (renminbi) peaked against the dollar in February at Chinese New Year and so did gold. 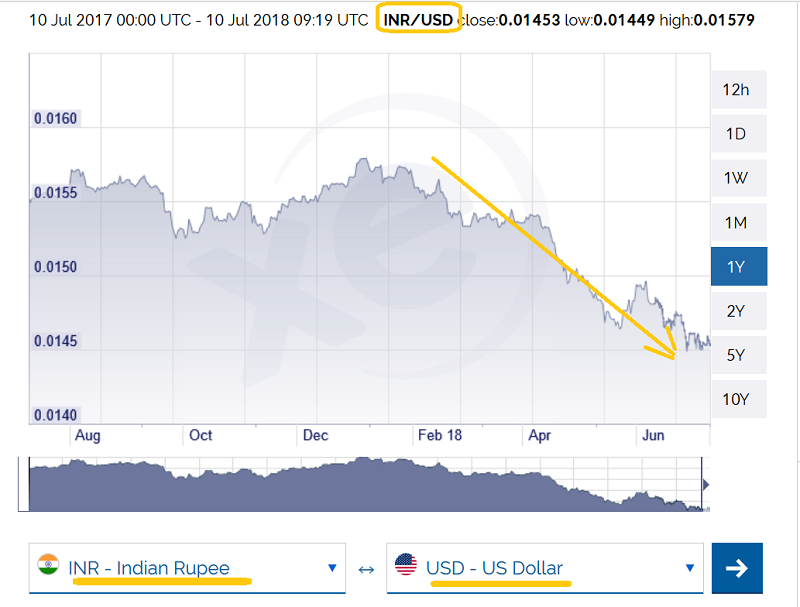 The rupee has also declined against the dollar in 2018. The bottom line is that there is a fabulous gold price sale for dollar-oriented investors, a modest one for yuan-oriented investors, and a very tiny one for rupee-oriented investors. 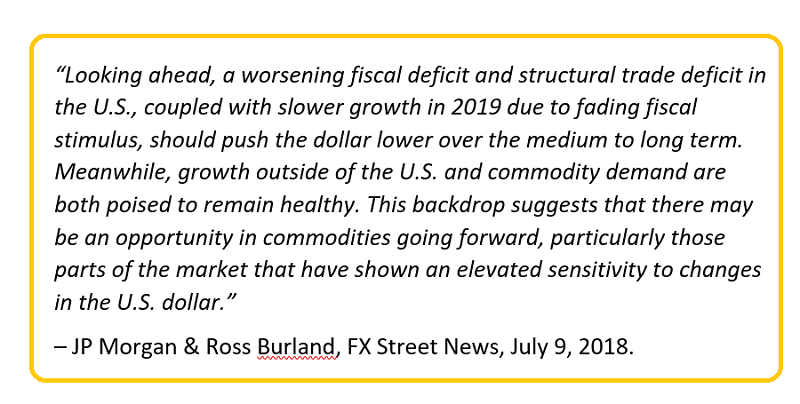 The good news is that most big bank and FOREX analysts agree that the US dollar is in a long-term decline. That’s positive for gold. A decline in the euro against the dollar can spur gold buying from Europeans. In crisis situations that buying can become large enough to drive the global gold price higher. Trump’s second round of corporate tax cuts will likely only cut the rate from 21% to 20%. That’s very modest US economic stimulus compared to the first cut. That’s more good news for gold. A closer look at the current gold price action. 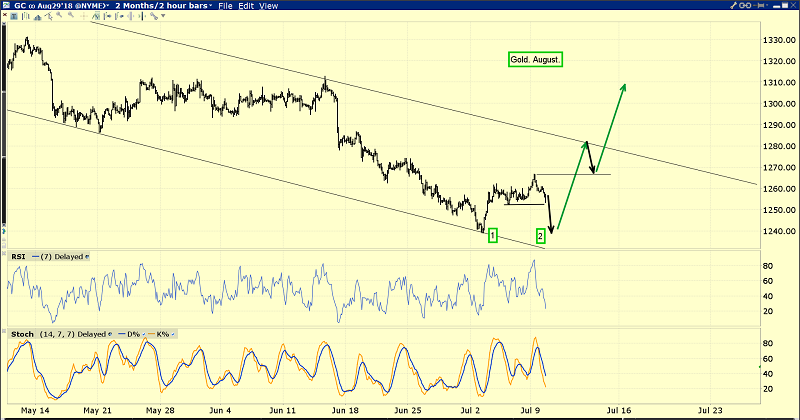 The current pullback can be bought, and if gold reaches $1240 it can be bought more aggressively. There’s an order to market cycles. Bank stocks tend to rally with base metal commodity stocks as the economy transitions from strong growth with modest inflation to fading growth with higher inflation. The bank stocks are rallying now, base metal stocks are very strong, and that’s a positive sign for gold stocks. This is the fabulous GDX versus gold chart. The technical action of gold stocks versus gold is awesome. It’s arguably the first time since the mid 1960s that gold stocks have mounted a sustained rally against gold while gold declined against the dollar. This is what happens when the Western world transitions from low rates and deflation to higher rates and inflation. Gold stocks are beginning a long period of outperformance against bullion, just as they did in the mid 1960s. 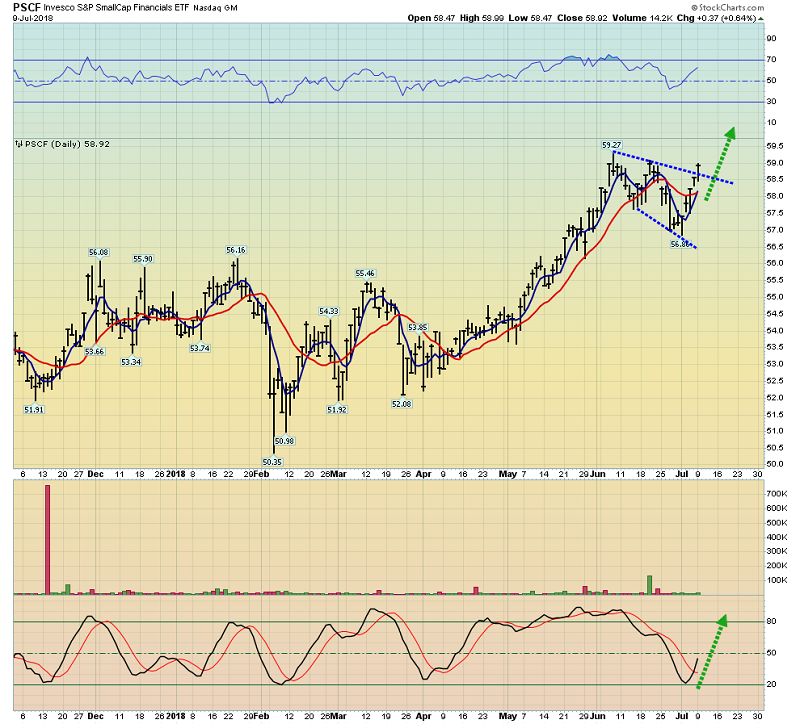 A large ascending triangle is forming on that chart now. All gold stock investor eyes should be focused on the 0.185 price zone. 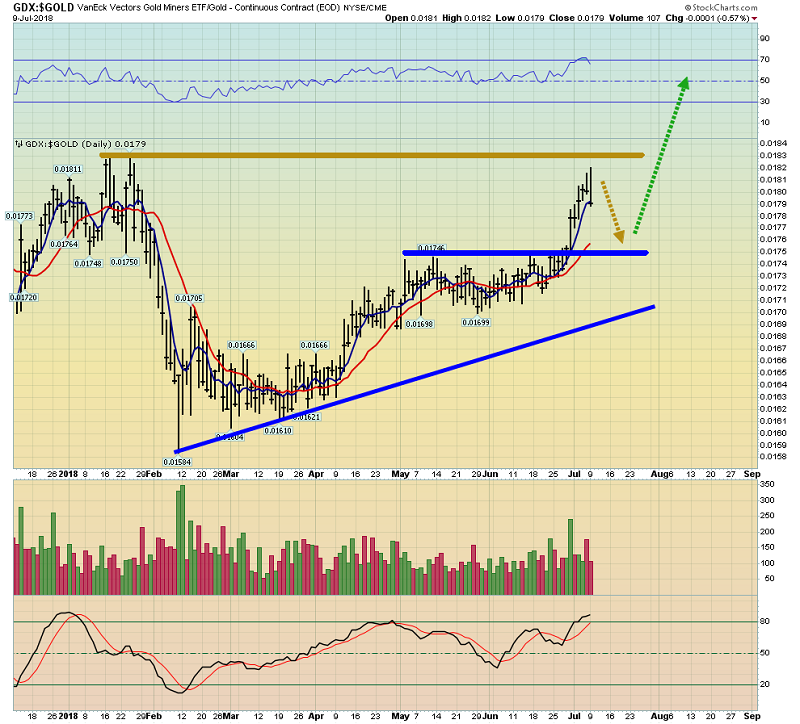 A breakout above that price opens the door for an enormous gold stocks rally against both gold and the dollar! 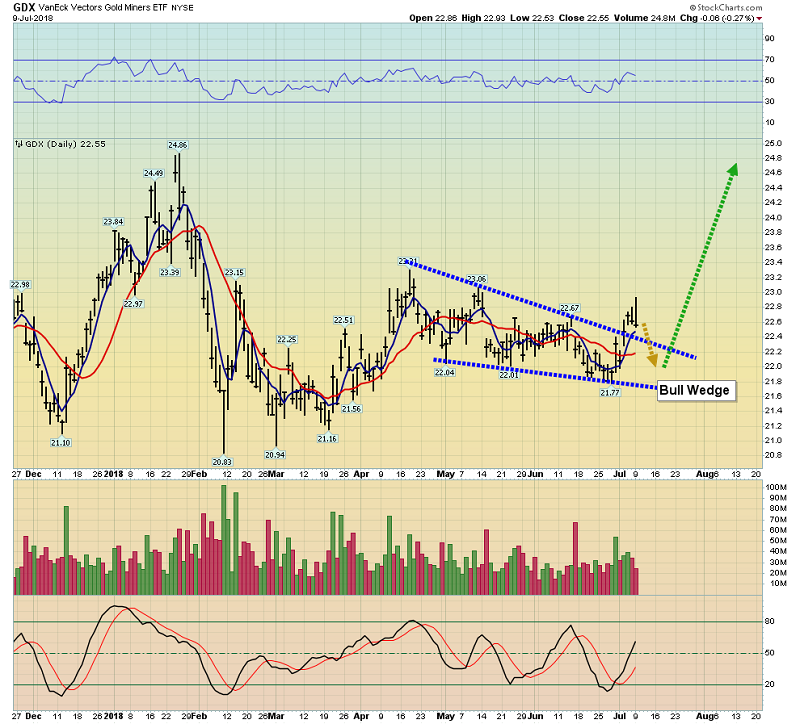 GDX has staged a nice upside breakout from a bull wedge pattern and the expected pullback is now in play. Aggressive investors can buy call options on any dip back into the wedge pattern. Everyone else should be buyers of their favourite individual gold stocks. A powerful upside rally to the $24.86 area highs for GDX appears imminent, with that price zone being only a pitstop on the road to much higher prices! Special Offer For Gold-Eagle Readers: Please send me an Email to freereports4@gracelandupdates.com and I’ll send you my free “A Golden Gun With Silver Bullets!” report. I highlight eight gold stocks that mine significant amounts of silver and are poised to race 50% to 100% higher by year-end! I include key buy and sell tactics for each stock.